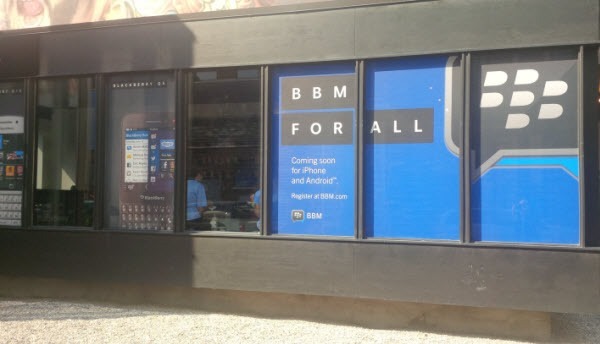 Earlier this week I visited the BlackBerry Experience at the Toronto International Film Festival. 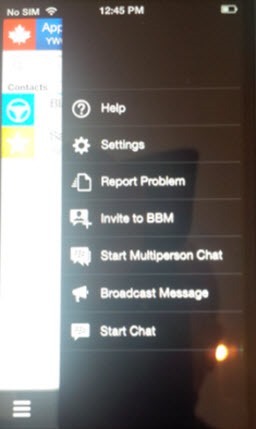 In addition to hosting three well received “seminars” on film production over a five day period there was a display of BlackBerry Messenger running on an iPhone 5 and Samsung Android phone. 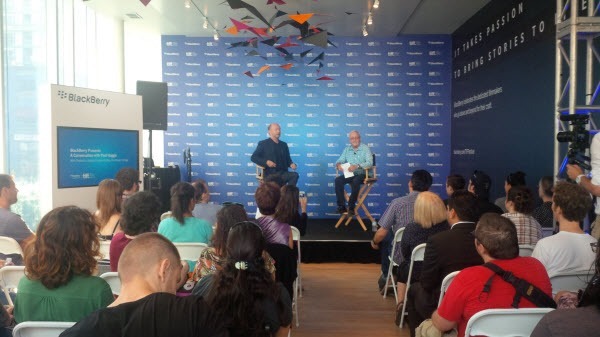 I not only listened in on an excellent interview session with Academy Award winning screen writer and director Paul Haggis but also had a chance to observe the BBM preview . 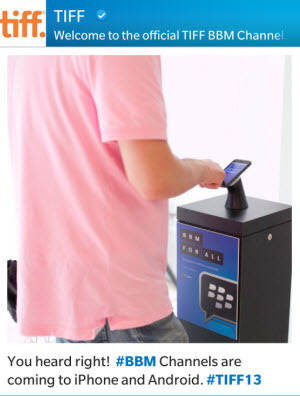 Even before entering the building you had a foretaste of what was to come in the BlackBerry exhibit. 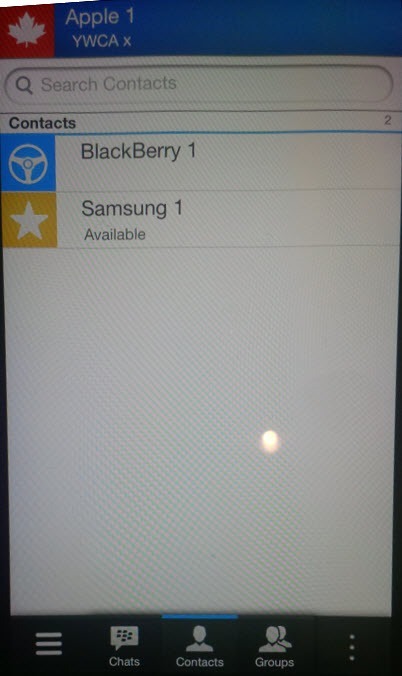 During the time leading up to the presentation I had a chance to check the BlackBerry Messenger display comprising an iPhone 5, a BlackBerry 10 and a Samsung Galaxy 3(?) 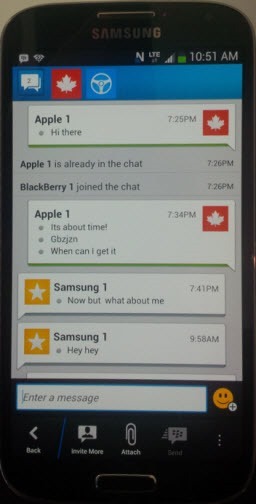 communicating with each other as BlackBerry Messenger contacts. Note that these are photos taken on my BlackBerry Z10 after requesting permission; they are not screen captures. Consistent with the original announcement, it only supports chat with support for BlackBerry Channels, BBM Voice and BBM Video calling to follow, hopefully by year end. And a question: will BlackBerry Messenger appear on the associated tablets? 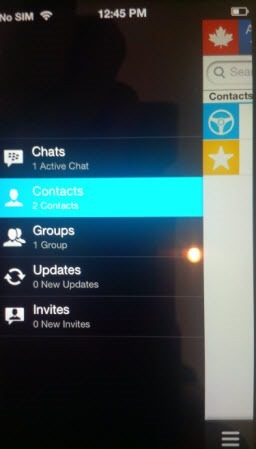 We never really got a feel for BBM on a larger size display format with the PlayBook. 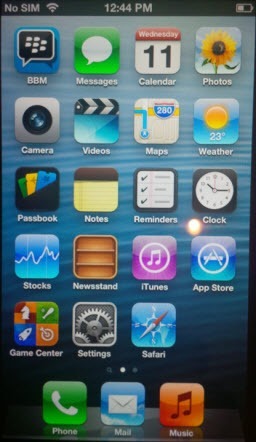 Whereas the Samsung device and BlackBerry 10 did not reflect a ceiling light, the iPhone 5 screen did, thus, the light blob in the images. iPhone displays need a non-reflective coating. At this point all we need to see is actual availability on the Apple App Store (submission was apparently made about three weeks ago) and Google Play. One question: if Apple is taking so long to approve, why doesn’t Apple clean out the other impostor apps that come up when you search for BlackBerry Messenger and BBM on the Apple App Store? Paul Haggis captivated his audience of budding film producers and aficionados for 90 minutes. He spent his 10,000 hour “Outliers” internship in London, Ontario and Los Angeles before really breaking out as a widely acclaimed screen writer, producer and director. Lots of lessons learned. Kudos to BlackBerry for sponsoring this and two other similar informational sessions that had also been well attended. And a small world story: turns out he attended a high school in London, Ontario where my mother had been a teacher at the time. But he probably did not take home economics as a subject. 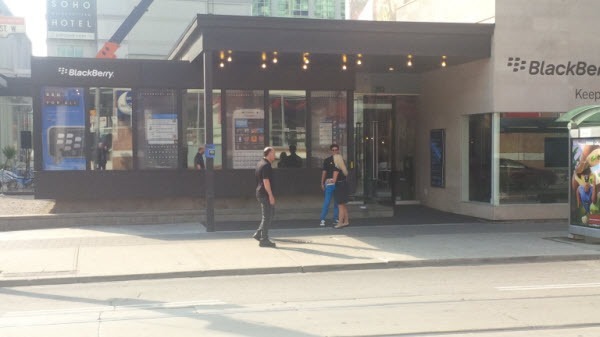 Bottom line: BlackBerry’s sponsorships at TIFF are not going to save the company but their participation certainly has been one of their more widely received marketing and sponsorship efforts. There definitely was a unique learning experience – in a subject area of interest to a largely non-technical audience. And looking forward to being able to communicate with my acquaintances who are encumbered with iPhones, iPads and Android mobile devices. As for confirmation of including BBM Channels, the TIFF BBM Channel post on the right, appearing as I completed the draft of this post, confirms they will be included.